About Arlak Amla Juice | Amla Juice naturally rejuvenating & it is rich in Vitamin C.
It’s an old saying in Punjabi that “Amla ka khana aur bujurgo ka kehna baad main yaad aata hai.” Amla has been given the status of ‘Rasayan’ in Ayurveda. It is a fact that if you take Amla continuously on daily basis right from the childhood, you will reap its benefits throughout your life. Indian gooseberry or Amla is a wonder fruit which has many health benefits. Scientists consider it as the most nutritious food across the world. Helps to boost immunity and metabolism. Prevents viral & bacterial diseases. Treats cough, flu & Mouth ulcer. Helps in reducing cholesterol level. Helpful for diabetic patients as well as respiratory ailments like Asthma. It acts as a blood purifier and flushes out toxins from the body. Amla speed up the metabolism which helps in fat- burning by taking this juice every day. It helps in hair growth and fights marks, pigmentation and blemishes. Regular intake of Amla helps in improving eyesight. Anti-inflammatory property of Amla juice helps in reducing swelling of joints. It is an excellent cleanser. Mix 30ml of Amla juice in a glass of water and consume empty stomach in the morning and evening. Take a gap of 30 minutes to the next meal or drink. 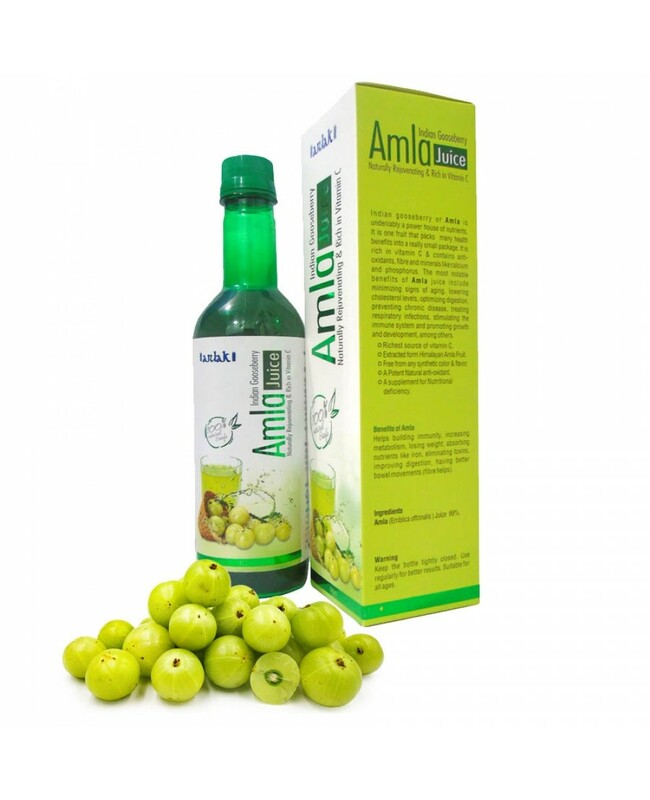 1) Amla- Also known as Indian Gooseberry which is rich in Vitamin C. It contains 99% Amla juice. It’s a pure Amla juice which is made by crushing Amla. This is extracted from Himalayan Amla fruit. It has anti- oxidant property.